Whenever I take a trip back on memory lane, one of the things I still remember is the fact that I dreamt about having a loft bed. Maybe it is because they remind us of summer camps, class trips or simply because they are fun, bunk beds have something that even today draws us to them and makes many of us want to own one. Taking a step back from the nostalgic feeling one gets with every look back at one’s childhood, it should be noted that, from a realistic, `adult-like` point of view, loft beds are quite practical. Due to the fact that they provide accommodation for at least two people in a limited spaced area, they are ideal for your children’s bedrooms or guest rooms. However, deciding what kind of model one should buy is not an easy task as it might seem. Because we are well aware of the fact that the internet is filled with numerous products of this type, we took it upon ourselves to make the selection process easier for you. To do so, we did the research for you, and we have put together a list of must have features and aspects that you should necessarily consider when shopping for the best loft beds for adults. Before jumping to the chance of ordering the first model you find yourself liking, it would be a great idea for you to take a step back and consider a series of aspects one can simply not go without. So, if you lack the time to think about the specifics that come with the decision of becoming a loft bed owner, give this buying guide a read, as it might come in handy. To be honest, one of the biggest advantages of owning this type of beds has to be its size or, to be more precise, the fact that they are space-economical. By following this line of logic, it becomes clear that, before rushing and placing an order, one should spare a few minutes and measure the space one has available. This `preliminary operation` is even more important if you are shopping for a wonder bed to solve your small open living space issue. Thus, if you want, let’s say, a bed for a studio apartment, having the correct measurements is crucial. To make sure that any inconvenience is avoided, my advice to you is to leave room for error and not order something that barely fits the space you’ve got at your disposal. This way, you won’t end up making your living situation even more uncomfortable due to even more lack of space. Ergo, be sure to measure twice and order once! Another equally important aspect you should pay attention to is the style of the chosen product. We all know that deciding to buy a new piece of furniture is no easy task. To solve this dilemma, it would work best if you settled for a model that fits with the overall style of the `designated` room. That is, you should do so that you avoid ending up with a product that seems not to match the other furniture pieces in your bedroom. After all, the simpler and the more minimalistic is your interior arrangement, the nicer and easier it is to the eye. Of course, this piece of advice does not hold if you want to put together a room that is extra fun and extra crowded. One solution to this problem would be for you to buy a bed that has the same color as other pieces of furniture in that particular room. This way, even if the new acquisition does not 100% fit the style, it will at least not look completely out of the picture. For most of us, our bed is the most comfortable and soothing place in the house. To make sure that this feature is not lost when deciding to buy a loft bed, there are some aspects you should consider. For example, you should pay attention to whether or not the chosen model has comfortable stairs attached to it. Due to the fact that these beds are situated in the upper part of the bedroom, the access stairs that allows one to get to them should in no way be difficult to climb or unsafe. So, try to select a model that has wide, sturdy stairs that can be effortlessly be used by everybody. Likewise, make sure that the model you end up purchasing is large enough to accommodate an adult. In other words, be sure that you are shopping in the adults’ section of the store. By doing so, you can rest assured knowing that you’ll be able to get many enjoyable hours of sleep without feeling incommoded by the lack of space. As any loft beds reviews, for sale, are prone to point out, loft beds come in many shapes and sizes. In fact, just search on Google cool loft beds for adults and you’ll be surprised to see how creative people were when designing these kinds of beds. 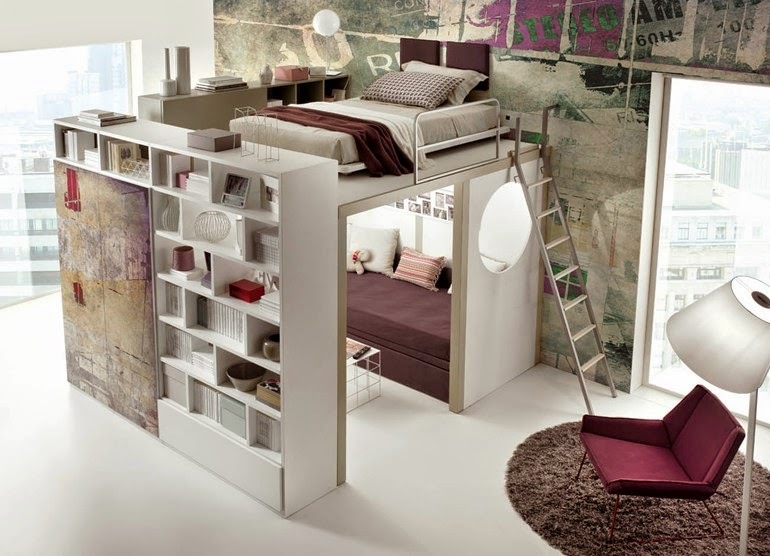 What is more, you should be aware of the fact that, a loft bed does not necessarily come in that classical college dorm design. In fact, some of the coolest models were constructed so that they combined the need for rest with that for studying or working. So, one of the most impressive and equally intriguing designs for a loft bed combines the comfort of a suspended bed with the practicality of a closet. Consequently, the owner can make use of a limited amount of space in an economical and smart way. Likewise, another popular design implies transforming the space additionally reserved to the second bed into a fun workspace area that contains everything from a comfortable reading chair to a completely equipped desk.